Jay Leno isn't sure the GOP contenders know how to prepare a Thanksgiving turkey. Two of Jay Leno's favorite subjects of jokes. Jay Leno kicked off the week leading up to Thanksgiving with some turkey jokes that got a lot of mileage out of the GOP field's recent foibles. 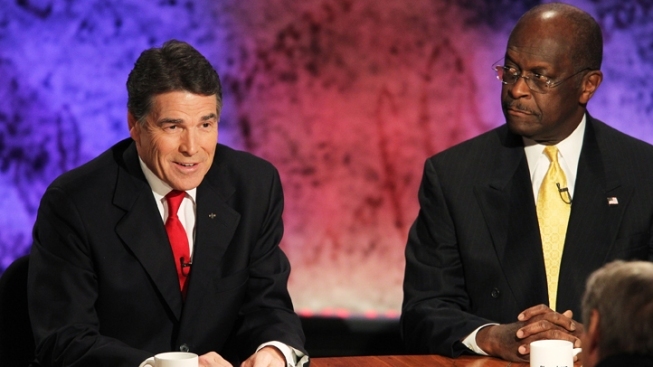 His targets were the two once-frontrunners who've dropped recently in the polls: Herman Cain, who's still dogged by sexual harassment allegations, and Rick Perry, who's dogged by his own gaffes. "Herman Cain, he has an interesting Thanksgiving tradition," Leno joked. "Every year, after he stuffs the turkey, out of force of habit he gives it $35,000." Cain has come under scrutiny for a one-year severance payment that was made to one of his former subordinates at the National Restaurant Association who claims he sexually harassed her at the time. And on Leno's Monday night show, Perry was ribbed for his role at the helm of a state that executes by far the nation's most death row inmates. "I'm not sure Rick Perry understands Thanksgiving, either," Leno said. "When they asked him if he were gonna deep fry a turkey, he said, 'Well, if he's found guilty.'"